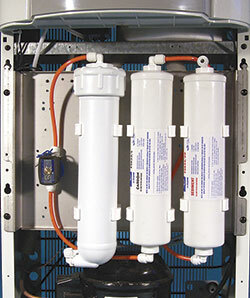 Deluxe 3-Temp Water Dispenser uses the existing water source to make a continuous supply of clean, great tasting water for offices or factories of up to 50 people. The reheat function raises the normal hot water temperature by 15º F for steaming hot tea or soup. 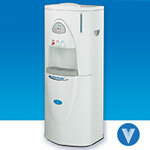 A deluxe 3-temperature, hot, room and cold bottle-less water cooler uses the existing water source to make a continuous supply of clean, great tasting water for offices or factories of up to 50 people. The reheat function raises the normal hot water temperature by 15º F for steaming hot tea or soup. 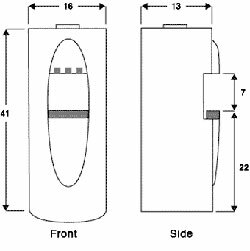 • Reboil raises water 15° F over normal hot water temp.